There has been a chemist on this site for at least 137 years and probably longer. In 1880, Cheshire-born William Dolman and his Cornish wife Sarah lived here along with their two young sons, William and Thomas and their baby daughter, Ethel. The children were all born in Cheltenham. Ethel was only seven years old when her father died, on the 24th March 1888 at the age of just 38 years. He left his wife Sarah well provided for, with a house in Brandon Terrace in Leckhampton and a prosperous business and home here at Everton House. The house in Brandon Terrace was rented out but William wanted Sarah to ‘have the use or enjoyment or receive the rent and profit for her natural life’. In William’s will he asked for a competent manager to take over the business on his death until a suitable buyer could be found. That person was Arthur J Wells who, although only 22, was described in the 1891 census as a chemist’s manager and he lived with the family at Everton House. As Sarah had been left financially comfortable, she was able to have some domestic servants to help her bring up her still fairly young family. When he was old enough, Thomas followed his father’s occupation and the chemists continued in the name of Dolman until 1960, although the Dolman’s had left by 1930. Welshman Mr Owen was one of the best known chemists – here for many years. Amongst the pill making devices and powder funnels that the chemist used was a piece of equipment that the chemist used for the dentistry side of the business. Several people can recall having teeth pulled in the back room – not a pleasant thought! During the 1960s Mr H C Robinson was the chemist here. A keen cricketer, he played for Gloucestershire Gypsies at one time. Late in 1974 Mr I G Pratt ran the business and was here until his retirement in August 1997. 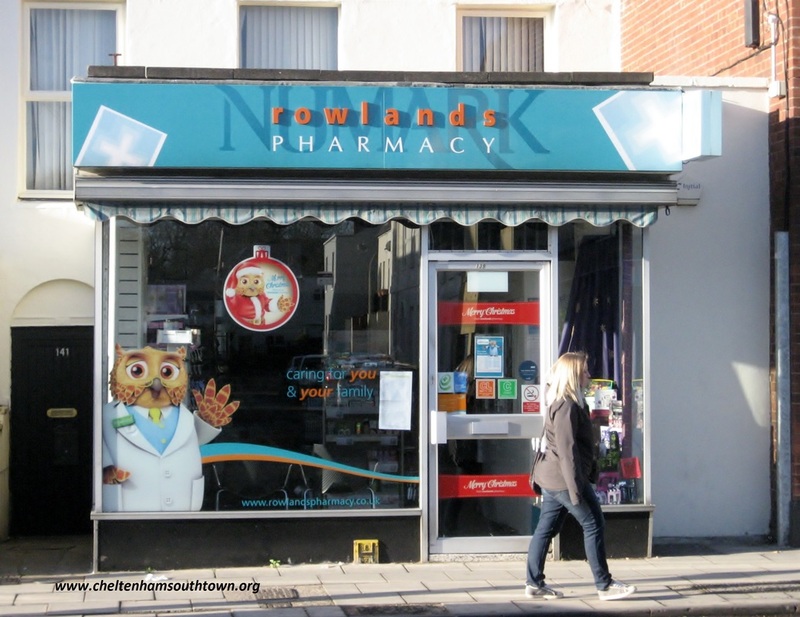 The business was then taken over by the company that owned the Leckhampton Pharmacy and in November 1997 the name was changed to the College Pharmacy, named after nearby Cheltenham College. It is not the first time there has been a College Pharmacy in Bath Road. During the early part of the 20th century there was a chemists with such a name near to the corner of St Luke’s Road. Formerly Numark, this is now home to one of two Rowlands Pharmacies in Bath Road.